On January 20, Lufthansa took possession of the first Airbus A320neo. Carsten Spohr, CEO of Deutsche Lufthansa AG, Airbus CEO Fabrice Brégier as well as Robert Leduc, the President of Pratt & Whitney and David Hess, Executive Vice President and Chief Customer Officer Aerospace for United Technologies made a special trip to Hamburg-Finkenwerder to celebrate the handover of the world’s first A320neo. The deployment of the Airbus A320neo marks another step Lufthansa is taking towards a “three-liter fleet” (per passenger and 100 kilometers) and significantly contributes to noise reduction. “We are pleased to be the first airline in the world to take possession of the Airbus A320neo today. The cutting-edge technologies of Airbus and Pratt & Whitney make the A320neo the most efficient and quietest aircraft for short- and medium-haul flights by far. The lower fuel consumption results in lower CO2 emissions and gives the A320neo a significantly improved carbon footprint. “The new engine technology also makes the aircraft significantly quieter,” says Carsten Spohr, Chairman of the Board and CEO of Deutsche Lufthansa AG. “Today we are proving once again that we as an aviation and airline group are pioneers in the development and introduction of technological innovations. This year alone Lufthansa will take possession of a total of 52 new aircraft for the group’s airlines” says Spohr. What makes the A320neo stand out are the new engines and improved aerodynamics. The addition of “neo” stands for “New Engine Option”. The aircraft is 15 percent more fuel efficient than today’s comparable models. It also shows impressive figures in terms of noise reduction: the 85 decibel maximum noise-level contour of a starting A320neo is around 50 per cent lower than that of the current A320. In accordance with certification standards, the cumulative noise emissions are about 29.8 dB below the applicable ICAO limits, which represents a significant advance in terms of noise and emissions reduction compared to the current fleet. This is possible thanks to the new engine technology. The PW1100G engines feature so-called “Geared Turbofan” technology, which leads to a significant reduction in noise levels and fuel consumption through the transformation of drive power. 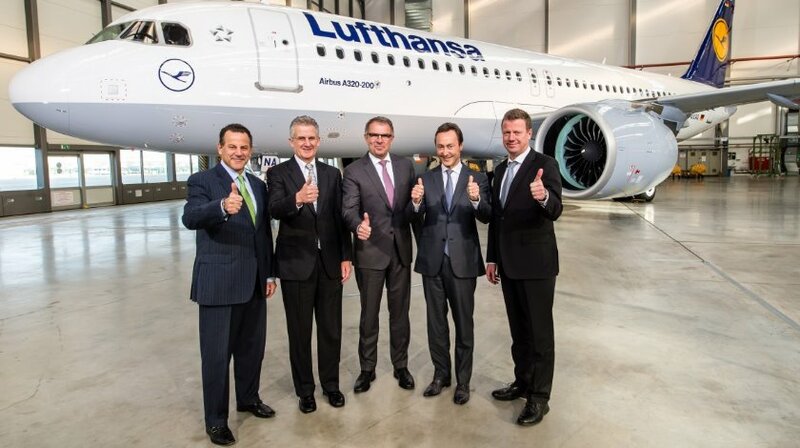 60 neo-aircraft with PW1100G engines will be delivered to the Lufthansa Group. In addition to the new engine technology, all new A320neo and A321neo aircraft will already be equipped with vortex generators on delivery, which have an additional noise- reducing effect. The wings are fitted with the recently newly developed wingtips. The 2.4 meter long winglets (sharklets) lead to less fuel consumption due to the resulting aerodynamic advantages. The first Lufthansa Airbus A320neo with the registration D-AINA (MSN 6801) is expected to be transferred to its future home base in Frankfurt later this week, before the aircraft will be used for its first commercial flight to Hamburg on 24 January. In addition to Hamburg Munich will also be one of the first two destinations of the A320neo. The Lufthansa Group has ordered a total of 116 neo-type aircraft, 45 of them the larger A321neo version. These new aircraft are intended for Lufthansa and Swiss. This order represents an investment of 13.3 billion US dollars according to list price. By the end of 2016, a total of five A320neo aircraft should have been handed over to Lufthansa and also be in use at the Lufthansa hub Frankfurt. The Lufthansa Group fleet is currently undergoing a fundamental renewal. The Group’s order shows a total of 251 brand-new aircraft at a list price value of about 30 billion euros to date. These are to be delivered by 2025.